I have a bit of a confession. I love boobys. That’s probably not much as a revelation, coming, as it does, from a boring, right down the middle, straight guy, but it’s also not what I’m talking about. I’m talking about sula nebouxii, or the blue-footed booby. There’s something endearingly goofy about these ridiculous looking marine birds. The sleekness of their bodies, and their grace in the air and water alike, makes it all the more hilarious watching them stumble around on land like drunken toddlers. Plus the wacky placement of their eyes that makes them look endlessly surprised, and did I mention their feet are freaking blue! If anyone asks me how it is I know what a drunken toddler looks like, I saw a video on YouTube once. That’s my story. Sticking to it. The blue tint of their feet which gives them their name is a sexually selected trait, and also an indicator of the health of the bird, as the blue pigment is difficult for their bodies to make. The younger and healthier the bird, the more vibrant the blue of their feet. Males perform a truly ridiculous looking mating ritual that involves strutting for the female while lifting their feet, displaying their wings, and gathering sticks, which he presents as gifts. It’s pathetic, silly, charming, and adorable. I could watch videos of it all day. While I was taking a mental break at work to watch videos about boobys, and chuckling at what that sounds like, I stumbled across a clip from a documentary. The focus of the clip was on the mating habits of the blue footed booby, and it turns out the blue footed booby is super promiscuous. 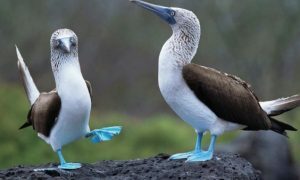 Maybe it’s something in the water of their home in the Galapagos Islands, maybe it’s whatever makes their feet blue, but they cannot stop getting it on. As soon as one or the other flies away to feed, the one that stays behind wanders over and starts the mating dance with a neighbor, like the blue-footed, wild kingdom equivalent of hooking up on Tinder. One of these days I would like to see them in person. Excuse me while I make a note on my bucket list. I was watching this video when I had the idea for the comic in this post. There’s something about the narrator that I can’t put my finger on, it’s around where he’s explaining the tendency of the booby for infidelity. His voice has this quality of…longing? I don’t know if that’s the right word, or if it’s maybe even just my imagination, but something in his voice that suggests a touch of bitterness. Maybe he’s remembering his own indiscretion and a time that he stepped out, got caught, and it didn’t work so well for him. Even better, as he’s recording, it’s his ex who is in the control booth. Hahahahaha. Mine is a cruel and mischievous laugh. My favorite line here is “Sometimes their mate catches them with another bird.” Both “mate” and “bird” have different meanings in Britain that work brilliantly for this strip.